I had lunch yesterday, with Rick and Su, at Eat Tokyo – it’s a regular favourite of theirs in Golders Green. I was very hungry, having cycled across Hampstead Heath, but I always find it easy to eat large quantities of Japanese food. I ordered a bento box which came with a starter of miso soup and contained, salmon teriyaki, prawn and vegetable tempura, tuna norimaki sushi and salmon and tuna sashimi. This arrived with rice in a separate bowl and satisfied even my greedy stomach. The teriyaki was succulent and the salmon skin was crispy. 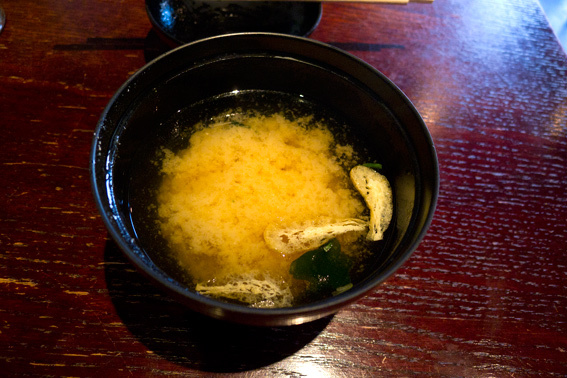 The tempura batter was light and crunchy and the raw fish was delicious with soy sauce and wasabi. I could easily eat lunch here everyday. 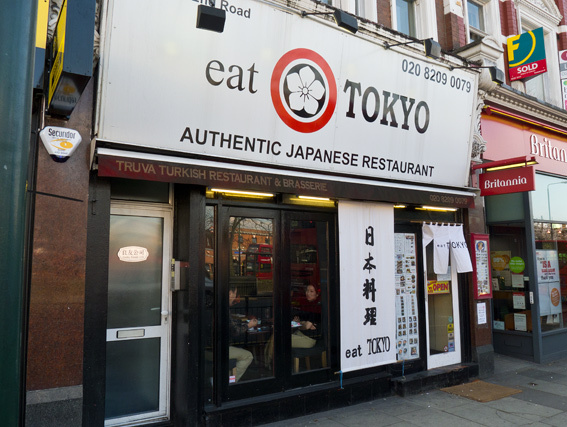 Eat Tokyo is at 14 North End Road, NW11 7PH. It’s a simple restaurant that has an extensive menu, it’s book like, with colour photographs for people unfamiliar with Japanese food. The staff are friendly and the prices are low. 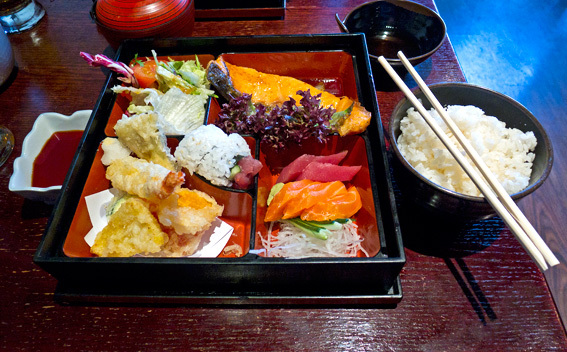 They also have a sushi bar in Soho at 27 Romilly Street, W1D 5AL. This entry was posted in Fish, Restaurants and tagged bento box, Eat Tokyo, fish, Golders Green, Japanese, miso, restaurant, sashimi, Soho, sushi, tempura, teriyaki, wasabi. Bookmark the permalink. Have enjoyed many fine meals here with good friends!